This section has been prepared by USA Hockey to assist parents in becoming more familiar with the sport of ice hockey and its organization and structure at the grassroots level. In this section, you will find information designed to enrich the entire youth hockey experience for parents and players alike. Keep in mind that, above all, the motivating factor for most children who enter an organized youth sports program is their desire to have fun. This is particularly true with young children, may of whom are newcomers to the youth sports scene. With a supportive attitude and a fundamental understanding of the “basics” of ice hockey, everyone will come away from their youth sports experience with a positive feeling. Parents can take the fun out of hockey by continually yelling or screaming from the stands. Parents should enjoy the game and applaud good plays. The stands are not a place from which parents should try to personally coach their kids. Kids often mirror the actions of their parents if they see mom or dad losing their cool in the stands, they’ll probably do the same on the ice. Some parents not only spoil the fun for their kids at the ice rink, but also in the car, believing this is the perfect place for instruction. Parents should try to keep things in perspective. There’s more to life than hockey, and the car and home are not places to coach. Parents are responsible for supporting and respecting the coach’s decisions and abilities. It is unfair to put children in a position of having to decide who to listen to – their parents or their coach. Parents should remember that if a child wants to improve, he/she has to practice – not just play. Even if a child is not the “star” player for a team, practice stresses the importance of teamwork, establishing goals, discipline and learning to control your emotions, all of which are important lessons children can use both in and away from the sport. The USA Hockey Skill Development Program has been developed to make certain that the child’s first experience with hockey is positive, safe and fun. Parents should avoid pressure or placing unreasonable expectations on their children, particularly at the Skill Development Program level. No matter what happens on the ice, children need the positive support of their parents. 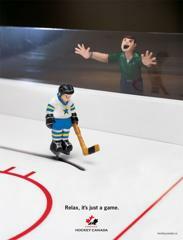 In 1996-97, USA Hockey introduced a national safety and awareness campaign called Heads Up Hockey. Designed to promote a safer, smarter, better style of play, Heads Up Hockey introduces concepts and techniques that will enhance your child’s enjoyment of youth hockey. For more information on the Heads Up Hockey program, contact your coach or league administrator or click here. The degree to which your child benefits from his or her youth hockey experience is as much your responsibility as it is theirs. In order for your child to get the most out of youth hockey program, it is important for you to show support and offer encouragement while maximizing a genuine interest in the team. Parents serve as role models for their children who often look to adults for advice, direction and approval. Never lose sight of the fact that you are a role model and strive to be positive. As a parent, one of the most important things you can do is show good sportsmanship at all times to coaches, referees, opponents and teammates. Avoid placing an exaggerated emphasis on winning. The most important aspect of your child’s youth hockey experience is for them to have fun while developing physical and emotional skills that will serve them in life. A healthy, risk-free environment that emphasizes the importance of fair play, sportsmanship, teamwork and, most importantly, fun will be invaluable for your child as he or she continues to develop a positive self image. The best way to help children achieve goals and reduce their natural fear of failure is through positive reinforcement. After all, no one feels good about making mistakes. If your child does make a mistake – and they will (remember they’re just kids) – keep in mind that mistakes are an important part of the overall learning process. Strive to be supportive and point out the things they do well. Make sure your child knows that regardless of outcome of a game, he or she is a winner.